We went to the Hannibal Library hoping to search old newspapers for accounts of THBS. The newspapers they had available are mostly on line, and there was no index available, so I decided not to browse through the microfilm. There were some other resources there and I made a few copies of interest: A short biography of Captain William Hilleary, the man replacing THBS after the latter’s death and an account of the battle of Vassar Hill including a confirmation that THBS died in the home of Rudolph March. 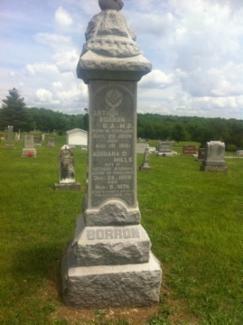 "County History by Jack Brumback: REBEL OFFICER DIED AT BIBLE GROVE, MO. "On the 20th day of July, 1862, Captain Tom Stacey of Colonel Joseph Porter's command died of wounds he received in the battle of Vassar Hill. 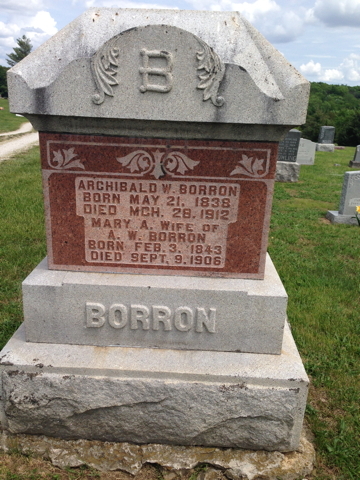 He died two days after the battle in a log house of Rudolph March (located 1/4 mile southwest of the battle site) and 1 1/2 mile north of Bible Grove. The land, where the house stood is now owned by the Dunne family. Just north of the log house was the location of the battle. The battle was fought on the old road east of the road that is there today...Capt. Thomas Stacey was raised in Miller Twp. in Marion Co., Missouri. Stacey died July 20, 1862, in the Rudolph March located in NE 1/4 of SE Quarter Section 7 Township 64N Range 12 West northeast of Bible Grove." We also learned that A.J. Stasey enlisted in Pindall’s Sharpshooters, a Confederate unit, as a Private in Company A, on August 31, 1862 at Camp Mitchell, Arkansas, near Stuttgart, a month after his brother’s death. He transferred at Little Rock, Arkansas to Tilden’s Battery on September 1, 1863. He was wounded slightly at Helena, Arkansas, one of the main engagements of Pindall's sharpshooters. Cousin Steve Ayers picked us up in his truck and drove to Macon where we picked up Aunt Donna and drove up into north Shelby County to visit the old THBS II home site. 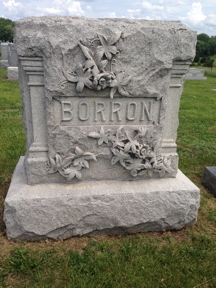 We drove through Atlanta where several Borrons lived. 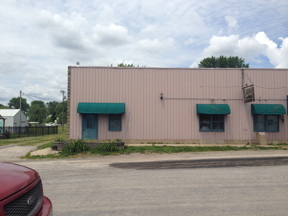 The building in which Grandma and Grandpa Stasey had their restaurant is still there but much changed. 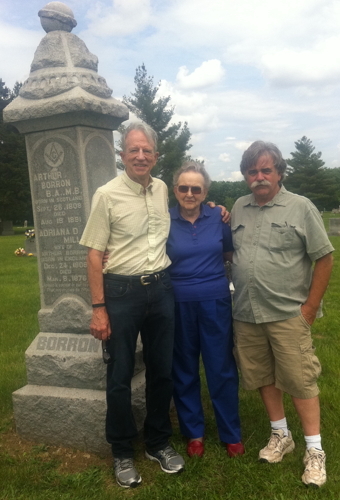 We drove through Economy, Missouri, where Dr. Borron, the original immigrant lived, to Mount Tabor cemetery where most of the Borrons, including Dr. Borron, are buried, and finally on up to the Borron farm. This is the location, and from the looks of it, the building in which Thomas and Mamie Stasey operated a restaurant in Atlanta, Missouri. This photo was taken inside the Atlanta restaurant, on July 25, 1949. 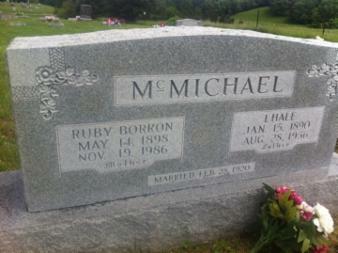 Mamie Stasey is in the center. 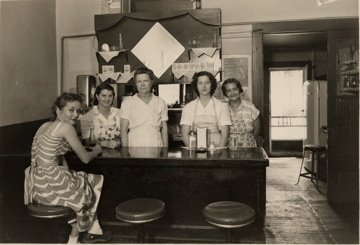 Pictured (L-R) are Helen Smoot, Helen Smith, Mamie Stasey, Elsie Zuccarini, and Mildred Ratliff.